A Swimlane is a theme-oriented visualization of roadmap items that works best for "no dates" roadmaps or more agile roadmaps that can be pivoted on themes, sprints, or epics. Swimlanes allow you to plot items on a dynamic grid and choose fields for both horizontal and vertical pivots. The other type of roadmap visualization in Roadmunk is a Timeline, which provides a time-oriented visualization (see Add a Timeline to a view). For more on Timelines and Swimlanes, see Visualizations: Timelines and Swimlanes in the Quick Guide. 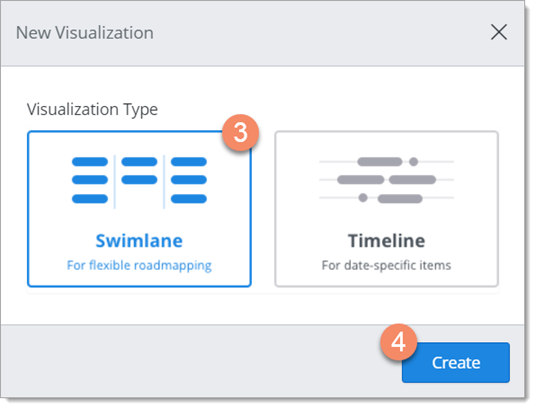 To create a new Swimlane visualization of a roadmap, you start by creating a new roadmap view for the Swimlane and adding filters to determine which items and milestones you want to appear on the Swimlane. After you add the Swimlane, you can add pivot headers and format the layout and colors. 1. In the View dropdown on the Roadmap navbar, select the view you want to visualize. 2. On the View navbar, click the Visualize button. TIP: If you see a Timeline or Swimlane icon on the navbar instead of the button, the view already has a visualization. 3. In the New Visualization dialog, select Swimlane. 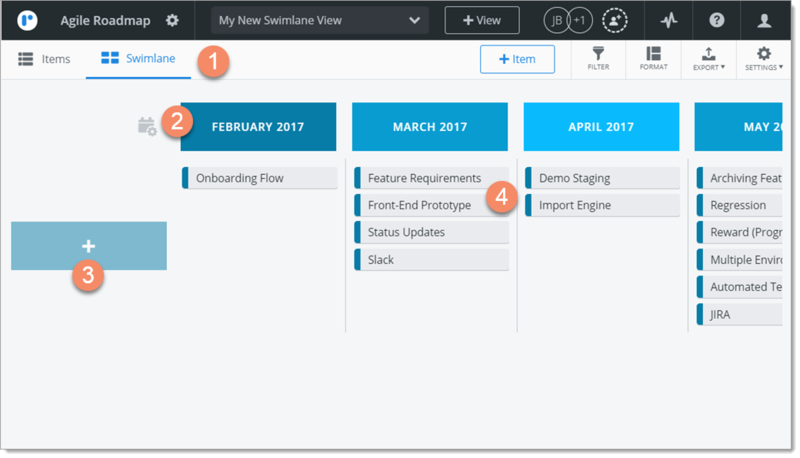 Here's a snapshot of what the new Swimlane might look like before you customize and format it. Only items that meet the filter criteria are visible on the (a blue Filter icon on the View navbar lets you know the view has filters). NOTE: Milestones are only visible in a Timeline. The Visualize button on the View navbar is replaced by a Swimlane icon. To the left is the Items icon to open the Items Table. TIP: Milestones are not visible Swimlanes so the Milestones icon doesn't appear. To view milestones in the roadmap, open the All Data view. The column headers are one of the two pivot headers in a Swimlane. In a new Swimlane, the column headers are set up as a time-based pivot using Months. You can customize the headers by selecting a different time period (for example, Quarters or Halves). To see how, go to Customize the time-based pivot in a Swimlane. You can also set the headers to any field in the roadmap in order to create a theme-based pivot. To see how, go to Add theme-based pivots to a Swimlane. The row headers are the second pivot header in a Swimlane. In a new Swimlane, the row headers are blank and ready for you to select the field to use in order to add a theme-based pivot. To see how, go to Add theme-based pivots to a Swimlane. Unlike Timelines, Swimlanes have a single vertical header. You can also set up the row headers as the time-based pivot in a Swimlane the same way you do the column headers. Whichever headers you choose, you can have only one time-based pivot in a Swimlane. The view's items are plotted in the Swimlane on a grid in alignment with the column and row headers. Items are labelled by their name. You can add more data pivots to the Swimlane by changing item labels, using color, and more. To see how, go to Format a Swimlane's layout and colors. You can edit the items in a Swimlane as well as add new items without going back to the Items Table. To see how, go to View and edit item details and Create roadmap items. Why don't I see any items in my Swimlane? If you don't see any items in your Swimlane, it's most likely because of the view's filters. You can check a view's filters by clicking the Filter icon on the View navbar to open the Filter panel. To make sure the items you want appear in the Swimlane, you can edit the view's filters to match the items, or you can edit the items so they match the filters. Who can add a Swimlane to a view? Adding a Swimlane to a view is the same as adding a view to a roadmap. You can a Swimlane to a view if you are the roadmap Owner or the roadmap has been shared with you as an Editor. If you share the roadmap as a Viewer, you can't add Swimlanes to any of its views.